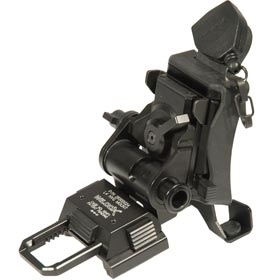 The Wilcox L4 G37 Low Profile Breakaway Mount allows firm attachment of a variety of NVGs to a MICH/ACH helmet integrating Wilcox’s Standard Army One-Hole Shroud. 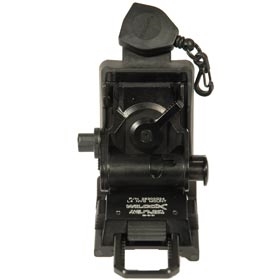 This NVG mounting system allows the mount to “break away” from the base under a stressed condition, such as when prompted by interference during fast roping, maritime operations, hard impact or when entering or exiting mobility platforms. Without the Wilcox breakaway feature, the potential for induced neck injury and NVG breakage are increased. 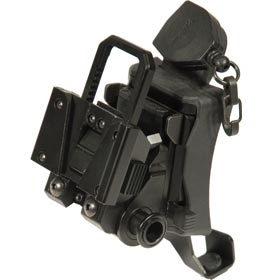 The Wilcox L4 G37 configuration additionally features a Wilcox Army compatible shroud, and provides easy attachment of the mount to any helmet drilled with a standard one-hole configuration using a single screw and hook assembly. The Wilcox L4 NVG Mounting Systems Product Line is featured with a wide range of adjustments to customize the position of the Night Vision Goggle for proper eye position, and provide a maximum low profile position to the helmet.